Alongside user reviews, the site now shows key survey information such as ER wait times and the quietness of guest rooms. Yelp wants finding a good hospital to be as painless as tracking down a decent burrito. As such, it’s partnering with the nonprofit news organization ProPublica to more data to its business listings for hospitals, nursing homes, and dialysis clinics. Where a restaurant listing might show operating hours and price ranges, hospital listings will show ER wait times, the quality of doctor communication, and the quietness of guest rooms, drawing on survey data from Medicare.gov’s Hospital Compare website. For nursing homes, much of the data comes from ProPublica’s own research. For instance, users can look up the number of beds, any serious deficiencies, fines paid due to those deficiencies, and payment suspensions related to poor performance. Meanwhile, listings for dialysis will show death rates and the frequency of hospital readmissions. The data is all available now on Yelp’s website, covering 4,600 hospitals, 15,000 nursing homes, and 6,300 dialysis clinics, the Washington Post reports . Yelp and ProPublica promise to update the data every quarter. If there’s one complaint about the revamped listings, it’s that they only link to the home pages of Hospital Compare and Nursing Home Inspect, instead of the actual provider pages where much more information is often available. 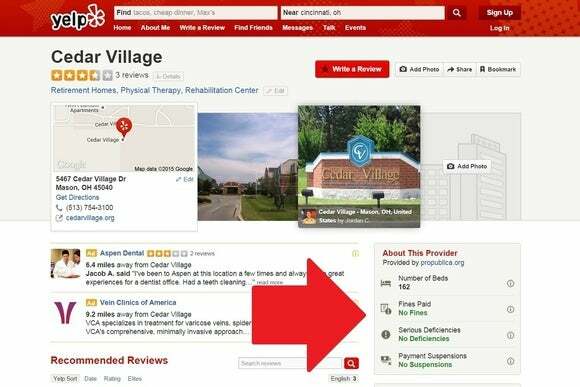 The new information doesn’t interfere at all with Yelp’s existing user reviews, so readers can still help themselves to the horror stories and effusive praise of actual patients. Why this matters: While anecdotal reports might be enough to go on when choosing a burger joint for the night, the same isn’t true for a decision as important as health care. Still, users might not know about resources like ProPublica and Medicare.gov. Yelp’s search engine mojo could help that data get in front of more people and help them make better-informed choices.